This past week I went 1-1 on my underdog ML picks for a profit of 0.60U (+3.8U Overall). The Jets couldn’t get the job done at home against the Lions, but the Chiefs dominated the Patriots at Arrowhead. I’ve looked over the games and this is a super tough week to target underdogs that have a good chance to win SU. I’m going with the Bears, Falcons and Chiefs to win on the ML, but two bets will be small. Carolina (2-2) has lost two in a row against the Steelers and Ravens badly. I really don’t have a great read on this team yet, but they don’t look even close to the Panthers from last season, which isn’t good. The Chicago Bears (2-2) have lost two at Soldiers Field where they normally dominate, but they’ve won both of their games on the road (Jets & 49ers) and I expect that early season trend to continue. Last season Carolina won games with defense, but this year they’re allowing 24.0 PPG (19th) and 140.8 RYPG (27th). 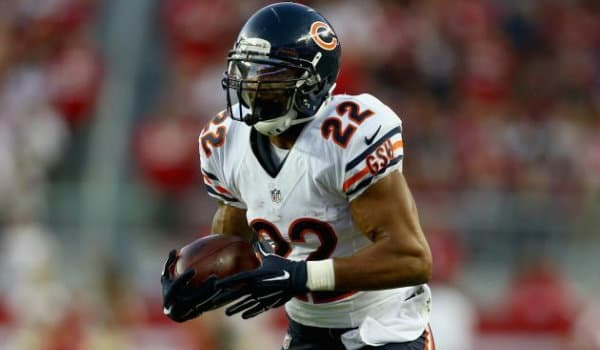 Matt Forte and Ka’Deem Carey should both have plenty of success on the ground. I’m still waiting for Brandon Marshall and Alshon Jeffrey to pick it up as well. Right now the two stud WR’s on the Bears have 36 receptions combined whereas Martellus Bennett and Forte have 53 receptions. These two teams didn’t play each other last season, but in the last three games (2010-2012) the Bears are 3-0 including one road win. If Chicago’s offense can get rolling the Panthers won’t be able to keep up. The Giants (2-2) have won two in a row in impressive fashion over the Texans and Redskins. Eli Manning is making less mistakes and everyone around him on offense seem to be making plays when needed. I just feel that the Falcons (2-2) are a much more talented team, especially on offense. Sure, the Falcons are 0-2 on the road and they just had an embarrassing loss against the Vikes last week. Matt Ryan and the Falcons offense averages 32.8 PPG (2nd) and 322.2 PYPG (2nd). The problem for Atlanta is that the defense is allowing 28.2 PPG (29th), 276.2 PYPG (30th) and 153.5 RYPG (28th). The G-Men rank 22nd against the pass (254.5 PYPG) and I feel the Falcons will exploit that weakness. I’m not overly confident with Atlanta on the road, but they have to win on the road at some point right? These two teams rarely play each other, so there is no point looking at the H2H trends. San Francisco (2-2) is another tough team to read, as they’ve been inconsistent and looked terrible at times this year. It looked like they were going to lose last week, but the Eagles offense was horrible. SF beat Philly (26-21), but the Eagles didn’t score a single point on offense. That won’t happen with KC this weekend. The Niners still have a great defense that’s only allowing 217.5 PYPG (7th) and 69.8 RYPG (2nd). Now that Jamaal Charles is back, the Chiefs have a great RB duo with him and the youngster Knile Davis. This game comes down to which run game can establish itself. Frank Gore and Carlos Hyde form a good duo, but I think the Chiefs run game is better, as they have a lot of different schemes they use.